"But I tell you! I really AM Batman!" 2014 Calvin Klein with belt loops. All righty, that didn't go so swell. Let's try the Bat-suit. Where am I? 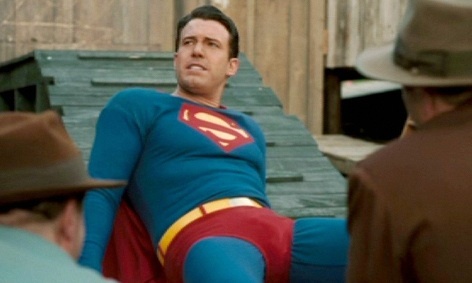 And what am I doing in this Superman costume? Ben: Hold on get my good side. Batman wears Superman pajamas - and dreams of what it would be like to be Daredevil. Reporters: Ben, if you could be just one superhero, which one would you be? Ben: If I could just be only one superhero, I think I'd be all of them. "Let's face it, this is not the worst thing you've caught me doing".